I am getting ready, and excited, for spring planting. I have a yard this year, a blank slate for gardening. The problem is I didn’t really inherit the green thumb in my family. My Parents and Grandparents have beautiful gardens and yards, I have always admired them. I so want to just dig in and grow vegetables and fruit trees and flowers galore. But if I’m honest with myself I know I will get in over my head and before I know it the whole thing will be overgrown. So I’m starting small. I’m not touching the big open yard just yet. I have a porch full of pots waiting for flowers and I know I can handle that. I also want to grow something I can eat so I’ve decided to start with a small, very small, herb garden on my deck. I’ve had 3 little green pots for a couple of years just sitting around. They needed something to inspire me to plant. Then this came in the mail, a $5 grab bag of vinyl from Springfed Decals. A steal! I needed to cut something immediately, and what better project then these little green pots. This is my first time cutting vinyl with my Silhouette, why did I wait so long! So many possibilities. I love how these turned out. I purchased a set of garden images from the Silhouette store and cut them out of blue, white, and orange vinyl. 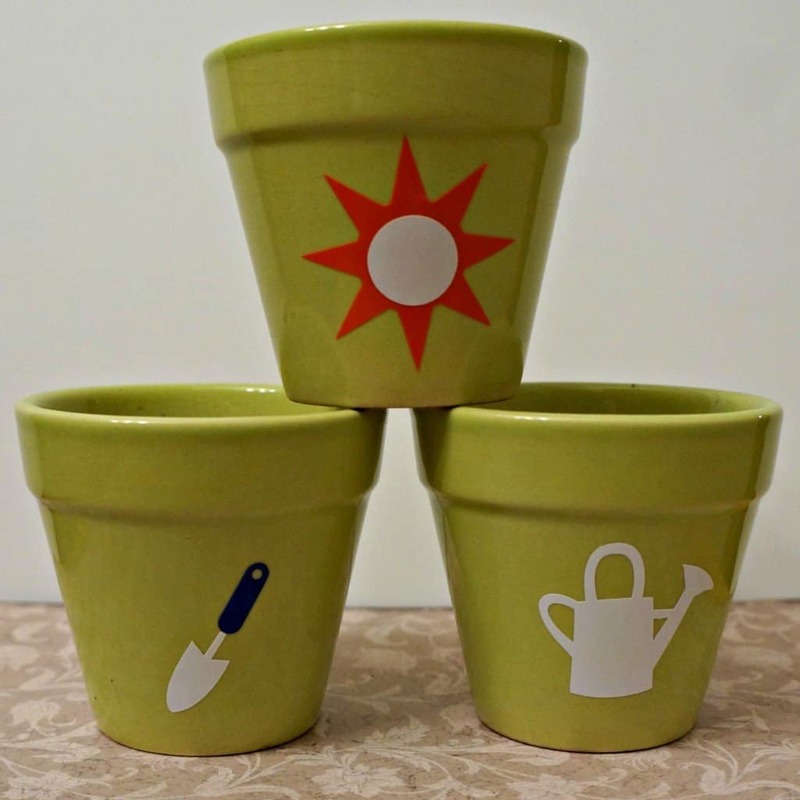 An easy project that brightened up this little trio. Do you have a green thumb? Any tips? I have a good start but really want to go bigger very soon! 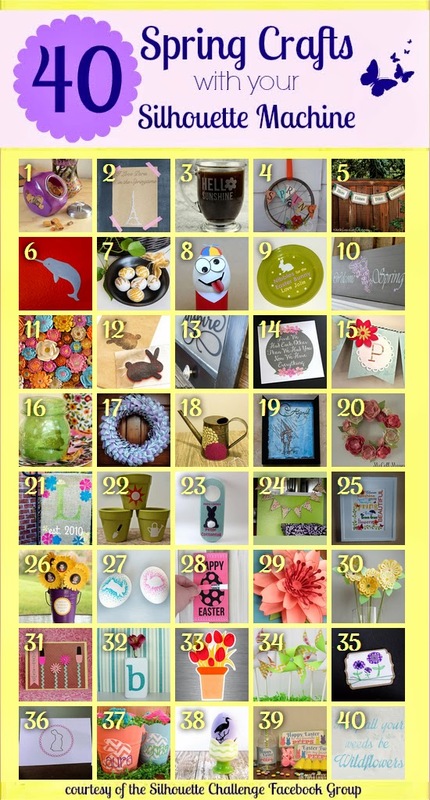 Want to Check Out More Spring Silhouette Projects? These are the cutest things ever!!! Thank you so much for sharing! These are really cute Sarah and I know what you mean about the vinyl & Silhouette. It took me forever to try it and now I LOVE doing it! 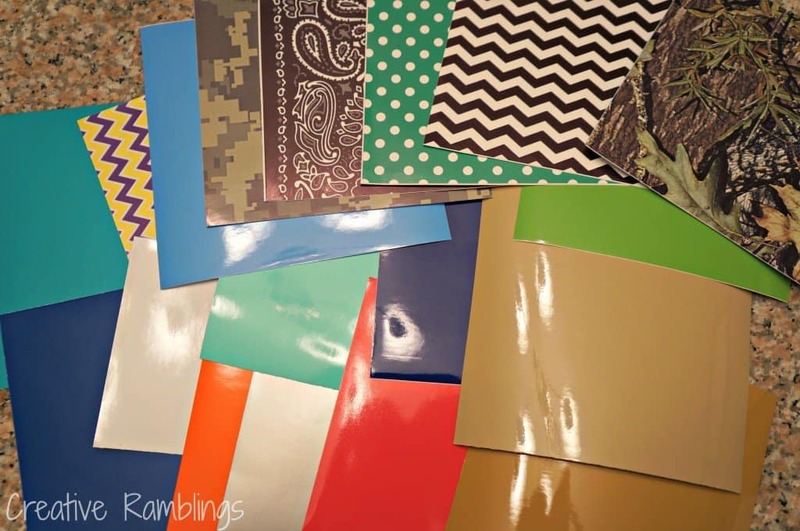 Thanks for linking up to the Craftastic Monday link party & joining in the Craftastic Mixer on Facebook! So addicting right?! Happy to link up. These turned our precious. What a great idea to use your silhouette! Cute pots! I have some painted ones that I have used in the past for herbs that a friend of mine painted for me a long time ago. Now I have a small herb garden out back and put the herbs in there. Good luck with your herb gardening. Thanks Kimberlee, I hope it evolves! These little pots are so adorable! I love them! Good luck with the garden! I love that you used your grab bag! I have so many fun colors and patterns to choose from also! I see many projects on the horizon using their samples. Have fun with that vinyl, so many possibilities. I’d love to check out your post. Thanks! Emily that’s awesome! Thanks for the encouragement. These are adorable! I was just thinking that I needed to pot a few herbs for us to use in cooking! 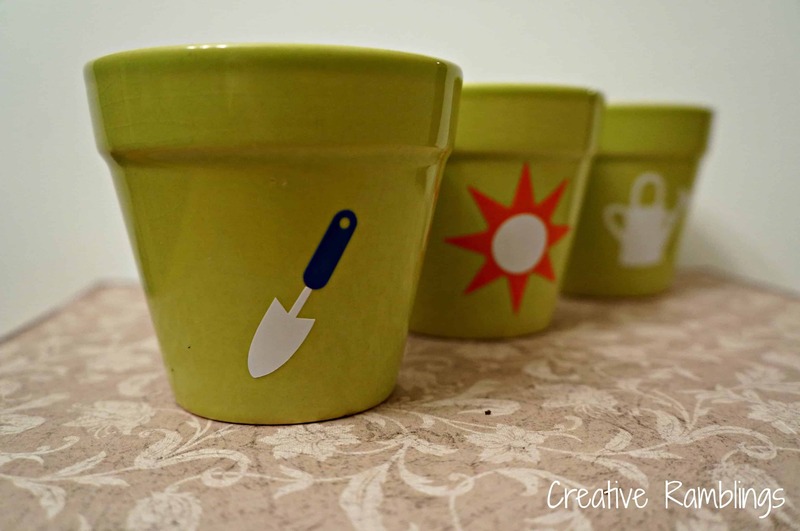 These are very cute – love the designs you choose for your little pots. What a great selection of vinyl in the grab bag too! I love these pots! I think you are wise starting out small with the gardening. I’m not very experienced either, but the more I work at it the more I learn! Have fun and good luck! Those little pots are super cute! I love this quick little added detail and how they completely transform your pots. I have a black thumb (seriously, I kill just about everything), but I tried planting some native flowers in my back yard last year. Here’s to hoping they come back this year!